A lottery syndicate is the official term for group play games. In a lottery syndicate, players pool their money to buy a shared set of tickets. Any prizes they win will then be split according to how much each participant contributed. Lottery syndicates are designed to boost participants’ chances of winning. You could be one of these lucky syndicate winners! Think of it this way: if you have 1 or 2 tickets, the odds of you winning the jackpot is slim to none. But if you have, say, around 10, 20, or more, then your chances significantly increase. In a nutshell, this is how syndicates work – and why they are quite popular among lotto players. You’ll split the winnings with the other participants. How much you win depends on the shares each person contributed to the syndicate. That’s why winning in syndicates is often seen as a double-edged sword. On the one hand, winning is much easier compared to solo play games. On the other, this means that you won’t get the full prize to yourself. As such, don’t expect your share of the pot to be astronomical. For example, if the prize is $500 and you have 20 people in your group, you stand to win $25 each if the shares are equal. The good news is that you can do something to increase your share of the prize: buy more tickets. Syndicates are typically designed so that if you buy more tickets, your share of the prize also increases. This shouldn’t be too bad on your budget — syndicate tickets are usually more affordable than regular lottery games. Let’s go a bit more in-depth. Don’t worry, you only need to know 2 common terms to get a better grasp of lottery syndicates: Lines and Total Shares. Lines are also known as blocks or tickets. These are the unique numbers that you purchase when you enter a syndicate. Unlike regular lotteries, however, syndicate lines are usually randomly chosen. Beyond that, lines also indicate how many chances of winning you have. 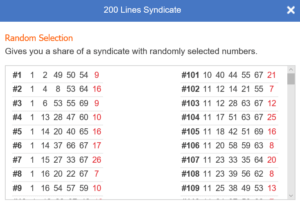 For example, if a syndicate has 100 lines, that means you have 100 chances of winning. A lottery syndicate is divided into equal parts called shares. The syndicate’s total shares tells you what percentage of the pot you’ll get in case of a win. For example, if a game has a listed total of 50 shares, it means that each share stands to win 2% of the prize. This is calculated by dividing 100% into the number of shares – in this case, 50. 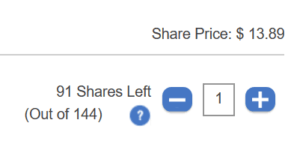 Of course, the more shares you buy, the bigger your slice of the pie. Numbers are chosen at random for a fixed number of lines. This is the usual type of syndicate play you will see. Numbers are still chosen randomly, but the process is designed to cover as many possible permutations of the numbers 7-14. Numbers are chosen randomly, but the process is designed to cover all possible combinations of the syndicate’s additional numbers. This ensures at least one match for the additional numbers. One spot on each line is configured to cover the lottery game’s entire guess range. This guarantees at least one number match. Every other number on each line is chosen randomly. Yes – you can play syndicate games offline, but I advise against it. There’s nothing inherently wrong with it; you just have to be sure that the people you play with can be trusted. For instance, in October of 2014, a man named Gary Baron kept his syndicate group’s $16.6 million prize for himself. This led to a two-year fight between him and his syndicate group. When you play syndicates online, however, the chances of something like this happening are slim to none. Online lottery sites have systems in place to ensure that each player gets their fair share of the prize. More than that, playing online also means that you can access lottery games that you normally don’t get to play. It’s a win-win situation, no matter how you slice it. 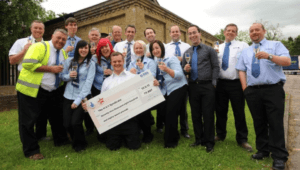 The Bottom Line – Is a Lottery Syndicate Worth It? Absolutely. Although the prizes you get won’t always match what solo play offers, you do get better chances of winning. Plus, you can always buy more lines to increase your share of the prize. It’s also worth noting that syndicate shares are usually more affordable than regular lottery games. If you don’t mind sharing the prize with other people, you should definitely try your hand at group play games. Not sure where to start? Try two of the best lottery sites in the industry, TheLotter and WinTrillions.